The Halloween holiday is October 31. 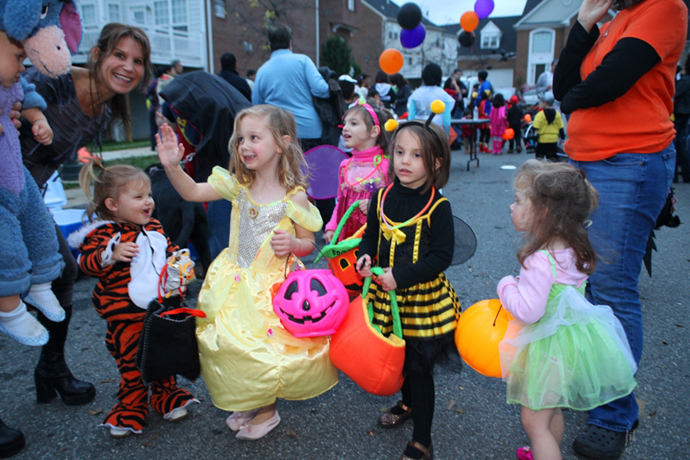 Tens of millions of children will put on costumes that night and visit their neighbors' homes. The neighbors will give them candy. Americans are expected to spend about $9 billion on Halloween this year. Most of the money is spent on costumes, decorations and candy. The National Retail Federation estimates that more than 175 million Americans are planning to take part in Halloween activities this year. The online candy seller CandyStore.com looked through 11 years of data to learn which Halloween candy is most popular in each American state. The company found that, overall, Skittles, M&M's and Snickers are the most popular candies. The favorite candy of Texans, though, is Reese's Peanut Butter Cup. And candy corn came in first in the states of Alabama, Michigan, Idaho and New Mexico. But children who live in Oregon may be among the luckiest in America; larger-size candy bars are a usual treat in the northwestern state. What will children wear this Halloween? The National Retail Federation says princess, superhero and Batman costumes are the most popular choices among kids. Adults, however, favor frightening characters, like witches and vampires. Even America's animals are getting into the action. Dog and cat owners plan to dress their animal friends as pumpkins, hotdogs and bumblebees, the retail group says. The Halloween holiday also had its origin in old beliefs about the return of the spirits of dead people. We're getting into the marrow of the film. He looked through the hotel advertisements until one of them took his fancy. 5.The National Retail Federation estimates that more than 175 million Americans are planning to take part in Halloween activities this year. Cadres have gone down to different grass-roots units to take part in manual labour. They returned to take part in the season's opening game. 6.Tens of millions of children will put on costumes that night and visit their neighbors' homes. Do not let tens of millions of family life I am bored hinder your footsteps. Tens of millions of American families have travelled the same path as ours.